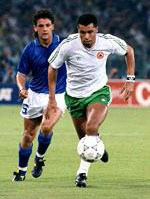 Ireland had qualified for a quarter final showdown against the host nation Italy at the 1990 World cup without winning a match in regulation time. Indeed the Irish had only scored two goals in their four matches to date and had made the quarter final courtesy of a penalty shoot-out against the unlucky Romanians. As usual, Italy were one of the pre-tournament favourites to win the World Cup and with Italy having the benefit of home advantage not many people gave Ireland a chance. The Irish relished the underdog tag and went into the match with their confidence buoyed by the knowledge that they were very difficult to beat. At Italia 90 they had not buckled when faced with the greater talents of England, the Netherlands, and - to a lesser extent - Romania. Irish football manager Jack Charlton also knew that even if his team conceded an early goal they would not fold. Ireland had fought back to earn spirited draws against both England and Holland despite the early concession of a goal in each match. The date was the 30th June 1990 and the venue was the Stadio Olimpico in Rome. There were 73,303 in the stadium that evening and it is estimated that 15,000 of them were Irish and they certainly made their presence felt. In what was the best footballing performance by the Irish players at Italia 90 they matched their illustrious opponents for skill and endeavour. Andy Townsend even had the temerity to dispossess the great Franco Baresi and leave him sitting on his backside. Ireland even had a chance to take the lead and would have done if Niall Quinn had managed to get more power into an early header on goal. As the first half wore on the Italians strengthened their grip on the game and after 38 minutes disaster struck for the Irish. A long range swerving shot from Milan's Roberto Donadoni caught penalty shoot-out hero Packie Bonner somewhat off balance. He could only parry the powerful shot as he stumbled beyond his left post on to his knees. The ball landed at the feet of 'Toto' Schillachi at the corner of the six yard box. Despite a desperate lunge by the great Paul McGrath, and with Bonner hopelessly out of position, Schillachi slotted home what would ultimately be the winning goal. For the rest of the match the Irish chased and harried in an attempt to prise out an equaliser but to no avail. In all honesty the Italians were the better team and had the better goal chances. When referee Carlos Silva Valente blew the final whistle the Irish knew that they had been second best on this occasion. The great Irish adventure at Italia 90 had come to an end at last. The management team, the players, and the fans had done themselves proud and had exceeded all expectations. A poignant image that lingers is that of Jack Charlton walking around the Stadio Olimpico carrying an Irish tricolour and acknowledging the truly inspiring Irish fans that had provided unbelievable support for his Irish team. But if Charlton thought that was the end of it he was pleasantly surprised by the extent of the rapturous welcome home that he and his team received when they got back to Ireland. It is estimated that as many as 500,000 lined the streets to give the boys in green a heroes welcome home. Republic of Ireland: Packie Bonner, Chris Morris, Steve Staunton, Mick McCarthy (capt), Kevin Moran, Paul McGrath, Ray Houghton, Kevin Sheedy, Andy Townsend, John Aldridge (John Sheridan 78'), Niall Quinn (Tony Cascarino 54').